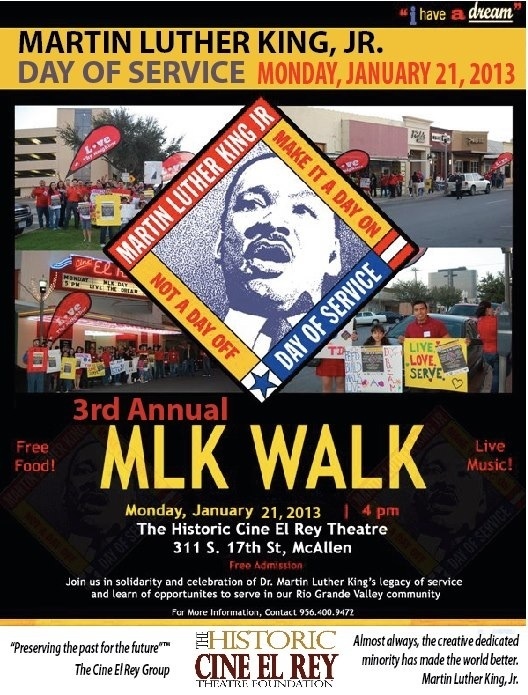 ‎The Historic Cine El Rey Theatre Foundation presents The 3rd Annual “MLK DAT AT CINE EL REY” MONDAY Jan 21st 4pm FREE Admission, Food & Entertainment. Join us and other non-profit organizations for this National Community Day of Service. Regional ARTISTS will offer their talents in special performances that will cover just about every ART form: poetry, dance, visual ART, choir ensemble, vocal soloist & acting. The report’s rollout is part of a three-day policy orientation by the TPPF, an Austin-based think tank that has been tied to some of the state’s most hotly-debated proposed higher education reforms. It signals a renewed push to reconsider the course offerings in the history departments of the state’s public universities, and particularly to boost the number of courses dedicated to the study Western Civilization. Jeremi Suri, a prominent historian at UT who has already read the report, called it disappointing. Written by Richard Fonte, the former director of the We the People program at the National Endowment for the Humanities, the study examined the background of professors and the syllabi for 85 courses offered in the fall of 2010 that could have counted toward the state’s requirement that students at public institutions take two American history classes. “We found that all too often the course readings gave strong emphasis to race, class and gender social history, an emphasis so strong that it diminished the attention given to other subjects in American history (such as military, diplomatic, religious, intellectual history),” Fonte wrote. “Strengthening the teaching of American history, government, and Western Civilization is at the very core of our recommendations for reform,” he added. This new report recommends that the universities have their curriculum reviewed, hire new faculty members with broader interests, make sure survey courses remain broad in scope and “depoliticize history.” The report will be given to the leadership at the universities. “We hope that they will read it and consider it instead of judging it without reading it,” said Ashley Thorne, director for the study of the curriculum at the National Association of Scholars. She acknowledged that the group is accustomed to taking controversial stances, including a strong opposition to affirmative action, which UT recently defended before the U.S. Supreme Court. Suri said the UT history program has a strong emphasis in military, political and diplomatic history; some on the left argue it’s too strong, he added. Suri, author of Liberty’s Surest Guardian: American Nation-Building from the Founders to Obama, said that departmental focus was one of the primary reasons he came to UT. He said the report makes no mention of a new university center focused on diplomacy and national security, or of the Normandy Scholars program, which offers students an intense focus on World War II and is one of UT’s signature offerings. Fonte said he anticipated that the university would defend itself against his findings and acknowledged that the report makes assumptions about courses based on their assigned readings. Suri argues that an accurate understanding of the nature of a course requires more involvement than merely a review of the syllabus from a single semester. “Come sit in, come engage us, if you really care,” Suri said, extending the same invitation to curious legislators. The amendment failed, in part because of his inability to articulate his motivation for offering it. Christian will not be returning this session; he lost his bid for re-election. But Thursday’s press conference is a strong indication that his proposal — or something resembling it — might. As for race, class, and gender, both Lindsay and Fonte said those topics should be taught, but with less of an emphasis than they believe currently exists. This article originally appeared in The Texas Tribune at http://trib.it/VU1Cql.